Mango Mania has been around in Bangsar for quite some time, but I only decided to try it recently. Usually, I’d insist on a long black in the evening but since I already had 4 cups of coffee at work, rif suggested Mango Mania instead. 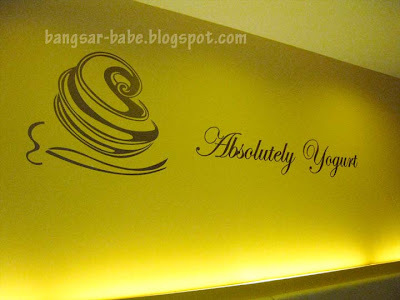 Located opposite EON Bank, it is quite hard to miss this bright yellow outlet. 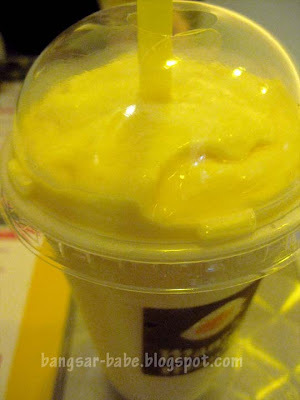 The mango madness (RM9.90) had a thick, creamy consistency without being gloppy. 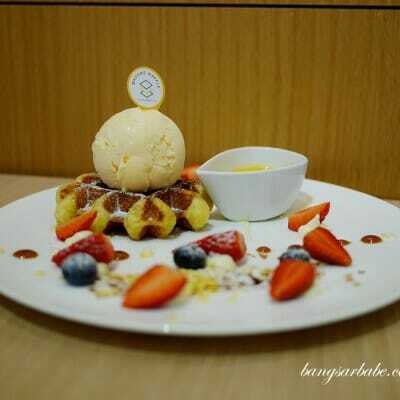 Its flavour is accented by the natural sweetness of the mango. While rif thought the sweetness was just right, I felt it could be a wee bit sweeter. It was a good smoothie, but it didn’t particularly wow me. 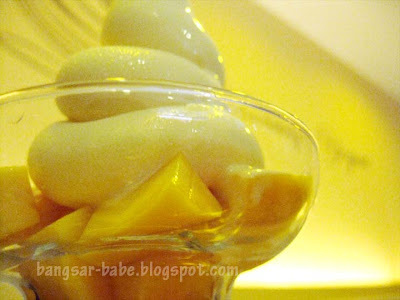 I had the frozen mango yogurt (RM8.90) which came with small mango cubes in a martini glass. This, I really enjoyed. The yogurt had a smooth and creamy texture, and the well-ripened mango was fleshy and fragrant. It is 98% fat free, making it the ideal dessert for weight-watchers. While the ambiance is somewhat cosy and great for chats, the service has plenty of room for improvement. The waiter looked like he couldn’t be arsed to take down our orders. Verdict: I have yet to try their other items, but the yogurt is pretty damn good. I would like to try the frozen mango yogurt which you had. OK… Mango Mania it is… hahahah!!! I'm a sucker for mango, especially those sweet sweet ones! i notice this place whenever i am there in bangsar. still havent step a foot in. will love to be there one day. Loved mangoes, sweet, sour, ripe, half-ripe …. And prepared in any form… maybe sticky rice with mangoes is my favourite! ai wei – Yeah…I also never thought of trying the place. But now that I have, I wouldn't mind returning! of course have to plan la… with a baby in tow, everything has to be planned in details. Don't wanna my plan to be spoilt! bad service? hmm, expected in most outlets here in Msia, without enough training in PR skills. really. and they charge 5-10% service charge pulak. hmmm, any added sugar ? Cumi & Ciki – I think got sugar…but I know most of the items have reduced sugar content, especially the yogurt. Joe – Got jockey parking…kekeke! Sugar Bean – Bon Appetit!